In Pakistan’s third elections since 2018, there have been widespread complaints by political parties, civil society and international media of rigging on a large scale. All day long there were reports of violence, allegations of pre-poll manipulation and the arrangements put in place by the Election Commission of Pakistan. Both PML-N and the PPP “said their monitors in many voting centers had not received the official notifications of the precinct’s results, but instead got hand-written tallies that they could not verify. “It is a sheer rigging. The way the people’s mandate has blatantly been insulted, it is intolerable,” Shehbaz told a news conference as the counting continued. “We totally reject this result,” he said. “It is a big shock to Pakistan’s democratic process.” The PPP also complained that its polling agents were asked to leave during the vote count in a number of voting centers. 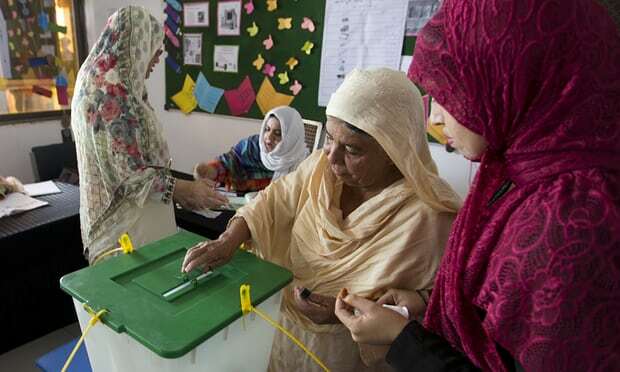 The Guardian in its report titled “Widespread allegations of election rigging,” pointed out that three major Pakistani parties, the Pakistan Muslim League-Nawaz, Pakistan People’s Party and Muttahida Qaumi Movement, have all “alleged voting irregularities, including that polling agents were not allowed into polling stations and voters were not given forms on time. The run-up to the election has also been plagued by widespread allegations that the powerful military was working behind the scenes to skew the contest in cricketer-turned-politician Imran Khan’s favour. His main rival Nawaz Sharif, who was jailed on corruption charges this month, has long had tense relations with the military and accuses the military of orchestrating his conviction. The Human Rights Commission of Pakistan (HRCP) in a statement noted: “that the ECP’s performance leaves much to be desired. While the latter has carried out its clerical functions reasonably well, the political content of its work has fallen short of expectations. Polling schemes were poorly rationalized, with many voters in the Lahore Cantonment, for instance, indicating they did not know where to go to vote. Numerous observers have also reported that many polling stations were clustered together, but too small to cater to the number of voters. As a result, the polling process remained sluggish through the day. This, compounded with ill trained staff in many cases, meant that many people who reached their polling station in time were compelled to queue outside the premises for want of space, but were not let in to cast their vote.